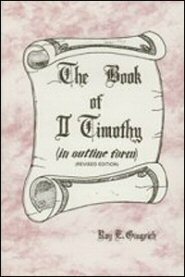 First Timothy and Second Timothy, two of the three “Pastoral Epistles,” are two of the Bible’s shorter books, but they are a source of much rich instruction concerning the organization of local churches, the government of local churches, the instruction and the correction of the members of local churches, and the teaching and the conduct of the pastors of local churches. Paul’s churches and their members needed this instruction just as our present-day churches and their members need this introduction. If churches today operated in accordance with the guidelines taught in the Pastoral Epistles, they would present a far more effective witness for Christ. Anyone who reads this commentary and appropriates its message will enrich his life and be a Christian well pleasing to our Lord and Master, Jesus Christ.